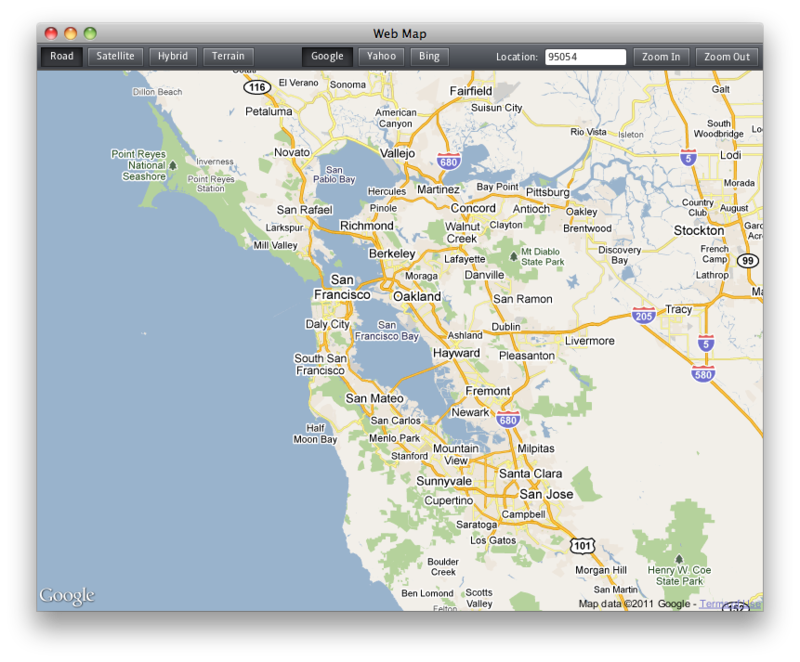 The last part of the application is a little css to style the toolbar and make it look dark to stand out from the maps. Awesome!!! I just love JavaFX!!! Does it not honour Windows proxy settings? The map area goes from white to grey here. No maps, no errors. why I can’t run this ? I’ve just installed JavaFX runtime , but when I run this application , it throws null pointer exception ? I haven’t seen this one before, but I’m sending it on to our deployment team to see what the deal is. Looks like some install related error (like the JRE is installed somewhere we didn’t expect, or the windows registry key was hosed, or something). If you’d like to email me directly I can get you hooked up with the right team and they’ll be able to help figure it out. Simply awesome, with few line of code, you can make beautiful things. But I have one question about threading in Java Fx, we can reuse the same logic like in Java Swing for the loading experience or you must use another paradigm for Java Fx? As you know, map loading can take a lot of time when you customize it with another informations. 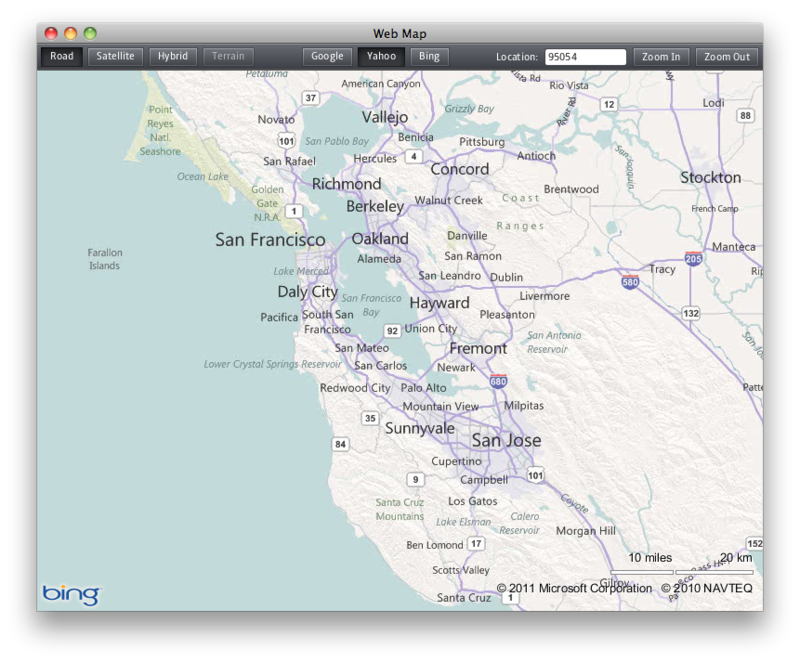 Small bug, the yahoo button loads bing maps and bing button loads yahoo maps. But cool program, keep up the good work. Would be a nice feature if changing the map provider keep the same loaded location. That works but not very well. In satellite mode and using Google as the source the image has grey blotches of “sorry, no imagery here”. It’s not a temporary thing because it persists after all network activity has stopped. Yet if I switch to, say, hybrid representation, these grey squares get filled. It also obstinately refuses to move to a new location: it remains stuck in Santa Clara no matter what I type in the Location field and how many I try to refresh. That sounds like we might have a bug in satellite mode as I can’t see why it should be any different to hybrid mode. There is a bug that the location is not persisted when switch provider, ie google to yahoo. 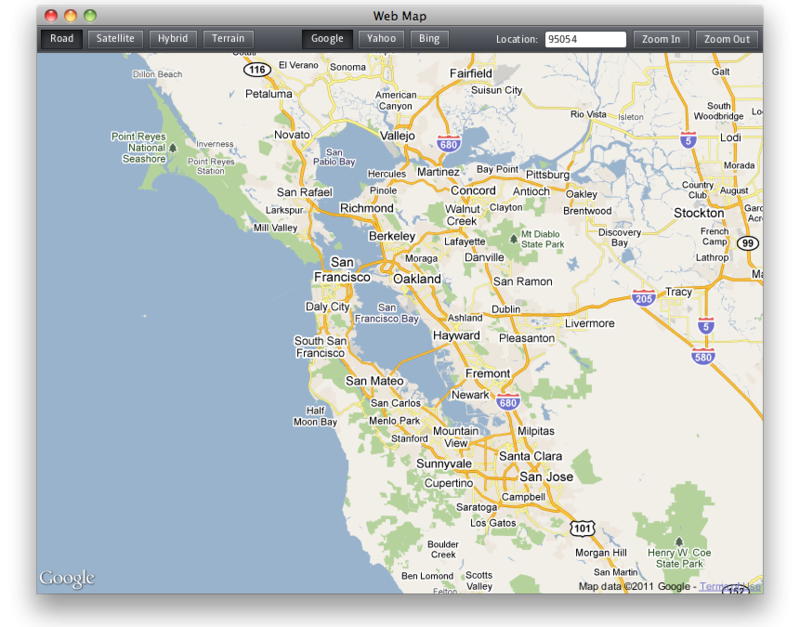 It always reverts back to santa clara. But it should work typing something like “london” or “new york” into the location box. Cool stuff. Most of the demos shown on this blog were built on a mac, yet there’s no mac version of the SDK available. What gives? The need to redeclare the webEngine and webView in the toolbar code is misleading. Without careful re-reading it looks like you are creating a second instance. Hello is there a way to avoid that fuzzy-look? Have anyone tried to print this map window area with JavaFX? I can’t get either the jar or the Netbeans code to work. The jar pops up a “JavaFX Launcher Error” which says “Unable to invoke launch method” and Netbeans can’t find JavaFX despite having the option of using “Default JavaFX Platform”. I want to use JavaFX with a desktop application but have had no luck in finding a functional example. The JavaFX runtime and SDK have both been installed. After adding the proper jar to the libraries it now only complains about line 38, 88, and 132. Netbeans seems to think WebView doesn’t need an input. Netbeans cannot find this class. Netbeans can’t find the setVisible method. could I add my own layer on top of map using this controll? This no longer works with JavaFX 2.2. WebView now only has a blank constructor. So how does one do this now? have you changed the links of the pojects? it doesn’t work. could you tell me where can i download? Both the Jar file and netbeans project for download are not available. page says no such page found.